Facebook Home: Zuck Summons Chatheads! And, there was much rejoicing. The long-rumored Facebook phone is, in fact, not a phone at all. Facebook Home is a family of apps that takes over an Android smartphone home screen, which sounds a lot like a skin and that sounds an awful lot like more Android fragmentation. 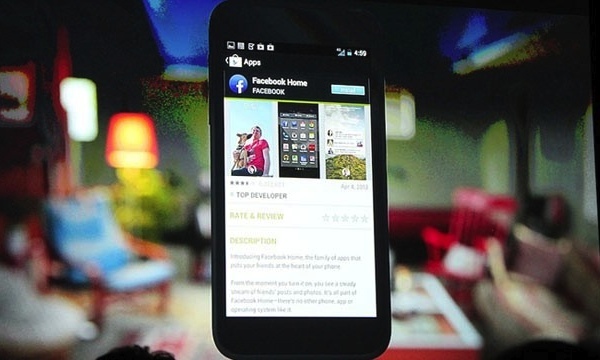 Due on Friday, April 12, Facebook Home will be available on Google Play store, initially only for smartphones. A tablet version is expected several months later, though no specific timeframe was given. A big part of this paradigm shift is Chatheads, a mobile only expansion of Facebook’s popular chat and messaging services. The twist is that Chatheads will be accessible within Facebook Home apps and, one suspects, eventually in third-party Android apps, as well. Facebook Home designer Joey Flynn said that users will be able to seamlessly switch in between apps and messaging, allowing users to participate in simultaneous conversations. On the device side of things, the $99 HTC First, also coming on April 12, ships with Facebook Home as part of its default install. Whereas expanding their mobile footprint is a no-brainer for Facebook, excluding iPhone users could be a fatal flaw — Apple smartphone owners are far and away the most engaged mobile users. Again, however, Facebook wants to take over Android user experience, so Home amounts to yet another forking of Android. Further, more than a few people will be seriously put off by the idea of giving Facebook even more access and control of their lives. Are you a phandroid? Chomping at the bit for Facebook Home?